OpenSocial, OpenID, and OAuth! Oh, My! Update: Google has posted a full-length video of my talk, along with a web-friendly copy of my slides. 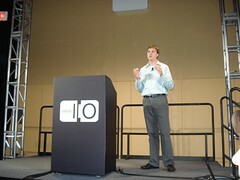 I was one of only a few non-Google employees who was invited to give a talk at Google’s big developer conference, Google I/O, in San Francisco. This was a huge event, and Google clearly went all-out on design and production. Not only were there a ton of talks and an amazing reception party, the open spaces were filled with colorful balls, beanbags, drink and snack stations (including made-to-order giant pretzels with salt), pool tables, demo areas, and more. 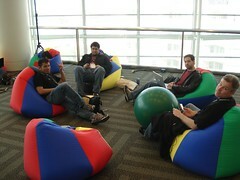 This definitely felt like being inside the Googleplex. I gave my talk on Thursday morning and the room was literally packed to the walls. Several people came up to me afterwards and lamented that they’d tried to get in but were turned away because the room was already over capacity. Wow, I guess people really do want to understand how the social web is opening up! I was very pleased with how the talk went, judging both by the positive feedback I received (in person and in tweets) and by the long and engaged Q&A session that followed for more than half an hour after the talk officially ended. Interestingly, 100% of the questions were about the details of how these technologies work and how to best apply them, rather than whether opening up the social web is a good idea in the first place or whether it’s feasible. Granted, this was a developer conference, but it’s still a strong indication to me of the momentum that our movement has generated, and the increasing extent to which people view it as both inevitable and good. We’re definitely making progress, and I couldn’t be more excited to keep pushing forward! Update: My partner-in-crime John McCrea has coverage of my talk, including photos and a video clip he shot towards the end of my talk.